PURPOSE: Revenge on Spider-Man for earlier defeats. 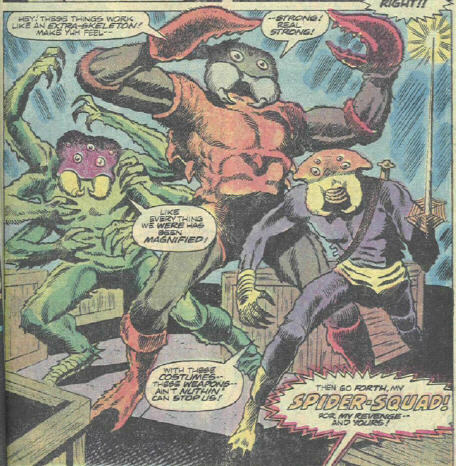 HISTORY: The members of the Spider-Squad were "master criminals," combining their talents until Spider-Man put a stop to their activities. They each sought vengeance on Spider-Man. They were hired by Anton DeLionatus, the producer for Delazny Studio's movie, "Spawn of the Spider." The movie was behind schedule and over-budget, when the stunt-man for the lead character, the Man-Spider, nearly fell to his death. The director of the film, Barney Muller, fired the Special Effects director, Klemmer, for designing "faulty equipment." Klemmer told Muller that he would regret this. (Amazing Spider-Man Annual I#11) - To replace the stuntman, the director of the film subsequently hired Spider-Man, who had been nearby to watch his girlfriend, Mary Jane who was playing the part of an extra in the movie. Delionatus saw the picture as a losing business venture, and hired the group of above-mentioned master criminals to become the Spider-Squad. He outfitted them with exo-skeletons designed by Klemmer, deliberately framing Klemmer in the process. The exo-skeletons multiplied their natural abilities several times. 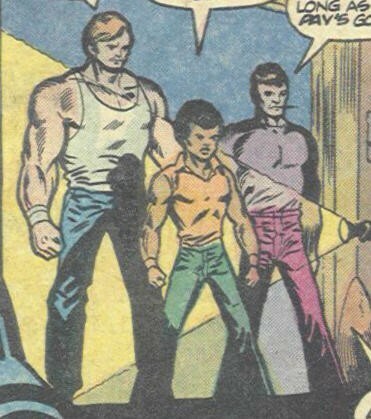 As such, Strongman had incredible strength, Acrobat had uncanny acrobatics, and tumbler became superhuman at...tumbling. Delionatus sent them to attack the set of the movie, so he could get the insurance money, and they could get their revenge on Spider-Man. 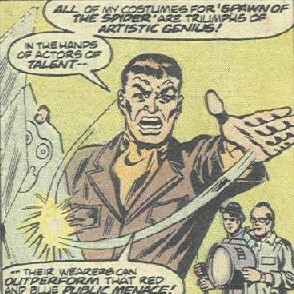 The Spider-Squad kidnapped Klemmer, who was then drugged, and placed at the site of the Spider-Squad's "base" in Yonkers. The Spider-Squad sabotaged a filming of Spawn of the Spider, destroying some of the equipment and briefly engaging Spider-Man himself before fleeing. 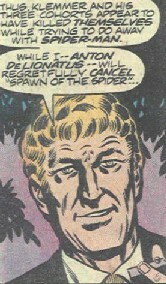 As DeLionatus planned, everyone assumed that Klemmer was the mastermind behind the Squad, so Spider-Man investigated Klemmer's apartment. The Spider-Squad was waiting for him again and ambushed him, but again fled after a short battle. Spider-Man followed them to their "base", an old silo on an abandoned farm in Yonkers. The Squad set at trap for Spider-Man, and he was caught in a tangle of sticky web while trying to sneak up on them. They had him at a disadvantage until he eventually broke free from the web, and tangled them up in it. Spider-Man made short work of the entangled Squad, and then found the unconscious form of Klemmer. DeLionatus, who was present a short distance from the silo, detonated some pre-set explosive charges, planning to kill all involved to prevent him from being connected with their activities, and seal the blame on Klemmer. Spider-Man, however, was warned of the imminent explosion by his spider-sense, and managed to get himself, the Squad, and Klemmer out in time. He then caught DeLionatus and presumably sent him and the Squad to prison. The "Strongman" in the top image is the middle one in the orange, the "Tumbler" is the green one with six arms, and the "Acrobat" is the purple one with the sword. Klemmer was the designer of the exo-skeletons and was fired from the film, "Spawn of the Spider." He swore revenge. He was framed by Anton DeLionatus. Anton DeLionatus was the producer for the film "Spawn of the Spider." He hired the Spider-Squad to sabotage the film, since he saw it as a losing business opportunity. His henchmen were stopped, but he had planted explosives in the silo where Spider-Man was. He was caught by Spider-Man, who escaped the explosives and imprisoned.